Toyota Camry has been one of the best-selling cars for many years. The reason is simple, it delivers what buyers want: an easy-to-drive roomy, comfortable and reliable family car. The 2007-2011 Camry has front-wheel drive and comes only as a 4-door sedan; the Camry Solara coupe has been discontinued after the 2008 model year. This generation Camry has a longer wheelbase and wider track compared to the previous model. The model lineup consists of CE (not available in Canada), LE, SE and top-of-the-line XLE as well as Hybrid. The sporty SE offers 17-inch wheels and firmer suspension. The Camry Hybrid is the second best-selling hybrid car after the Prius and should not be ignored if you want to save on gas. The 2008 Camry hybrid is rated at 33/34 mpg (7.1/6.9 L/100 km) city/highway. 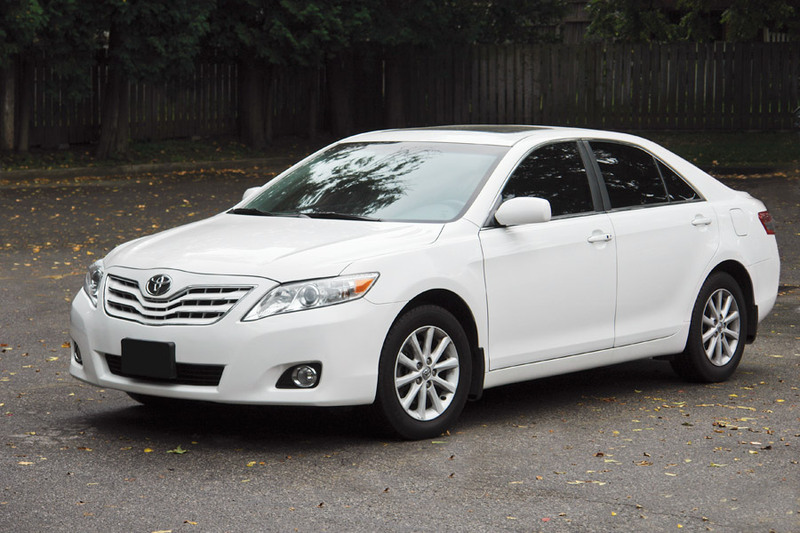 Overall, Toyota Camry is reliable, although there are a few trouble spots to watch out for. Maintenance costs are fairly low. Problems: The 2007 model received a number of complaints about things like a faulty driver's sun visor, hesitation at acceleration in 4-cylinder models and jerky transmission. A moon roof glass may need to be adjusted if there is a rattle in the open position; there was a service bulletin (TSB) for 2007 Camry on this issue. A failed ignition coil can cause a misfiring, often intermittent. Replacing one coil is not very expensive. If any of the ignition coils fail, it's usually recommended to replace all spark plugs if they are due soon. Iridium or Platinum spark plugs need to be changed at or before 120,000 miles. A failed strut can cause a clunking noise when driving over bumps, even though a strut may look OK visually. Replacing a pair of struts costs $550-$700. In some cases, the alignment might need to be done after a strut is replaced. Warped rotors can cause vibration or steering wheel shake during braking. Bad rotors need to be resurfaced or replaced to repair the problem. Toyota issued the Warranty Enhancement Program ZE7 to address some issues with excessive oil consumption in some 2007-2009 Camry models. This forum has some information. A faulty water pump was also common in 2009-2009 models. As of February 2019, Consumer Reports rates the 2007-2011 Toyota Camry as "Recommended." The reliability is estimated 'above average'. We know several people who drove this model Camry and they all were happy with the vehicle. Engine: The 2007-2009 4-cylinder Camry comes with the 158-hp 2.4L DOHC motor (2AZ-FE) carried over from the previous generation. For 2010, it was replaced with the more powerful and fuel-efficient 169-hp 2.5L engine (2AR-FE). The optional 268-hp 3.5L V6 (2GR-FE) has plenty of power and is very smooth. All three are reliable and can last long with good maintenance. Timing belt or chain: Both 4-cylinder engines and the V6 have a timing chain; there is no timing belt. Transmission: A manual transmission was only available in 4-cylinder models. 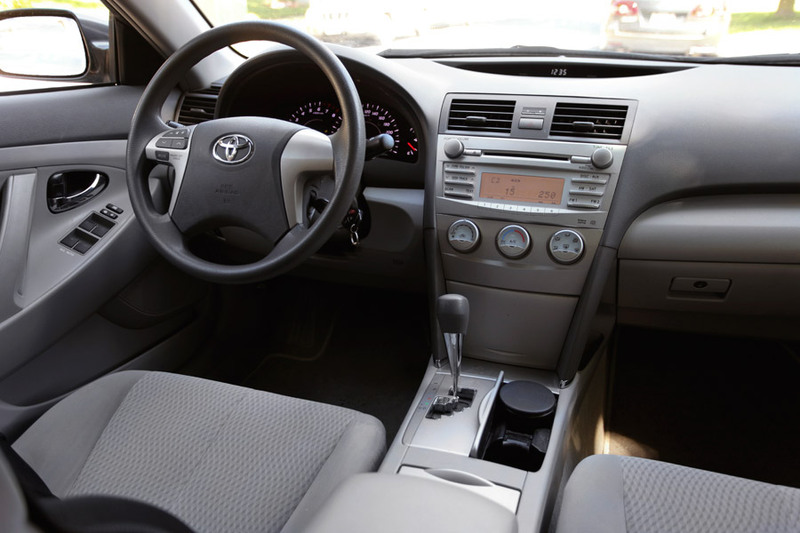 The 2007-2009 4-cylinder Camry has a 5-speed automatic; the 2010-2011 4-cylinder Camry comes with a 6-speed automatic transmission. The V6 Camry has a 6-speed automatic. Fuel Economy: For a 4-cylinder model, the EPA-estimated fuel economy is above average for the family sedan class. The V6 Camry is one of the most fuel efficient V6 sedans. With mostly highway driving, the 2010-2011 4-cylinder automatic Camry can drive up to 483 miles (777 km) on a 18.5-gallon (70 L) tank. Handling and Ride: The Camry is known for its soft smooth ride and this generation is no different. It handles easily and rides very nicely. Road imperfections are well absorbed by the suspension. Interior: Inside the Camry is very roomy. Front seats are large and comfortable. The steering tilts and telescopes. Controls are easy to use. Rear seat space tops most of the competitors. 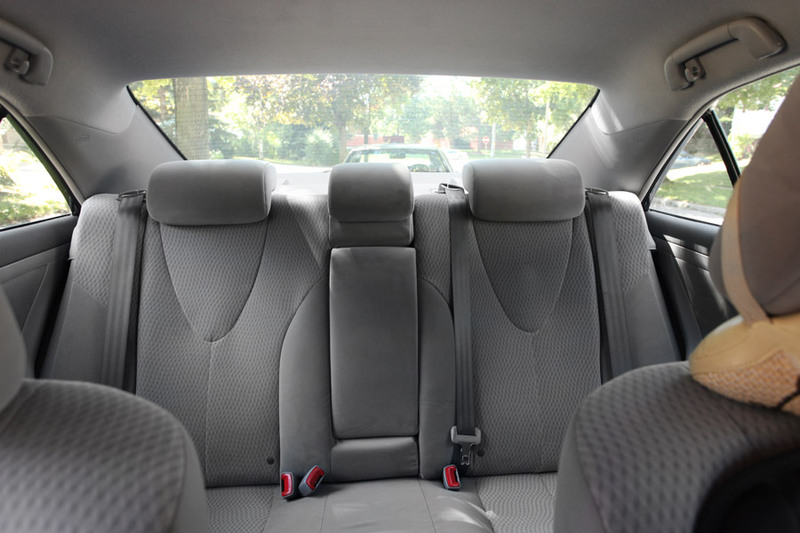 The split rear seat folds in all but Camry SE and Hybrid, although the pass-through opening between the trunk and rear-seat area area is rather small. The Camry XLE has a manually reclining rear seat with a center pass-through. The trunk is huge. Safety: Anti-lock brakes, driver's knee airbag, side and side curtain airbags are standard. Vehicle Stability Control (VSC) with Traction Control (TRAC) were optional in earlier models; standard from 2010. The 2007-2010 Toyota Camry received five stars out of five in the NHTSA frontal and side-impact crash tests. Starting with 2011 models, NHTSA has introduced tougher tests. See the table below. Pros: Reliability, fuel economy for the 4-cylinder engine, strong V6, smooth and quiet ride, spacious interior, comfortable seats, crash test ratings, standard safety equipment, large trunk. Cons: Conservative styling, small pass-through opening behind the rear seat, issues with an automatic transmission in earlier models, some interior materials could be better. Overall: Toyota's success is based on advancing in small steady steps; building on what worked in previous models. Mechanically, this generation Camry is not much different from the previous model, but it offers what it takes to be one of the best in its class. Competitors include Nissan Altima, Mazda 6, Chevrolet Malibu, Ford Fusion and, of course, Honda Accord. The more sporty Altima offers better city gas mileage thanks to its continuously-variable transmission, although it's not as roomy. Honda Accord also provides better road feel and more high-tech interior. Mazda 6 handles very well, but lacks in fuel economy. What to look for when buying a used Toyota Camry: To find out if the vehicle had accidents reported in the past, check used car history records. Check if the previous owners didn't skip on maintenance. When inspecting a used Toyota Camry, watch out for leaking struts. Look for low coolant level and coolant leaks. Watch for any of the warning lights on the dash staying on after the engine is started. Thoroughly test all the electrical features. Check the sun visors. During the test drive, see how the automatic transmission shifts. Lack of power or hesitation when accelerating from a stop was a common complaint for the 2007 4-cylinder Camry. Watch out for vibration and pedal pulsation during braking, it's also a fairly common problem. Read more what to look for when buying a used car. Before buying a car, have it properly inspected by a mechanic. An extended warranty is worth considering. Maintenance: The Camry's engine is very reliable, but engine oil needs to be changed regularly to keep it in good shape. The 2011 Camry owner's manual calls for using a high-strength type of a drive belt in the 2.5L 4-cylinder engine. We don't have the data for earlier years, so if you want to replace a drive belt, check the owner's manual. Keep engine coolant and other fluids clean and topped up. Check our illustrated car maintenance checklist. For more tips visit the Toyota Owners website where you can download an owner's manual or check car care advice, do-it-yourself guides, recommended oil type chart (follow Parts and Service) and more. 2.4L 4−cylinder (2AZ−FE) engine: 4.5 US qt. (4.3 liters). The recommended oil grade is 0W-20 (preferred) or 5W-20 oil.